Professor Kimberlé Crenshaw, the woman who coined the term intersectionality, tells Jenni Murray why feminism can't ignore race. Plus the creator of WW1 drama The Crimson Field. Professor Kimberlé Crenshaw, the woman who coined the term intersectionality, tells us why feminism can't ignore race. WW1 drama The Crimson Field - the story of frontline medics at one of the biggest war hospitals in Northern France. We talk to the writer and creator Sarah Phelps. Heiress Caroline Murphy tells us why she's resigned from the board of The Murphy Group - the company set up by her father. If women did not count, then they would refuse to be counted! In her new book Vanishing for the Vote, Jill Liddington talks about the suffragette boycott of the 1911 census. And the politics of parties when you're not invited. Sue Elliott-Nicholls on why some us find it hard to get over feeling left out. Kimberle Crenshaw discusses how Black women are facing inequalities in the US today. Sarah Phelps talks about the nurses tending the injuries of the Great War's wounded. Caroline Murphy discusses the company her late father had wanted her to run. Sue Elliott-Nicholls on not being invited to parties. Jill Liddington joins Jenni to talk about the women who boycotted the census. Professor Kimberle Crenshaw is the woman who explained why feminism can’t ignore race. In 1989 she coined the term intersectionality to explain how a woman can experience discrimination because of her race as well as her gender. Many like the way it makes feminism acknowledge the pressing experiences of those outside the white middle class, while others criticise the approach for dividing women. Jenni talks to Kimberle Crenshaw about intersectionality and the how Black women are facing multiple inequalities in the US today. 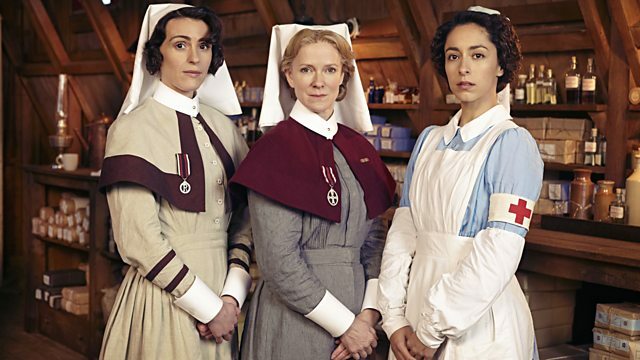 The first episode of WW1 drama ‘The Crimson Field’ airs on BBC One this week. Its writer and Creator, Sarah Phelps, talks to Jenni about the team of nurses and volunteers tending the injuries of the Great War’s many wounded in one of the biggest war hospitals in northern France. Suranne Jones and Oona Chaplin star in the 6-episode production – starting this Sunday (6th April.) What was life like in tented hospitals behind the front lines? How are these womens’ experiences so important to our understanding of life on the battle field? Caroline Murphy has been described as Britain’s most unorthodox civil engineering magnate. A union activist, gay rights campaigner and campaigner against sexual violence she joins Jenni to talk about her recent attempt to turn the Murphy group into an employee-owned organisation, resulting in her walking away from the company her late father had wanted her to run. The invitation have been sent out, the friends are getting excited about the big night. But not you. You’re not invited,. Sue Elliott-Nicholls on why some us find it hard to get over feeling left out. In 1911, British suffragettes were very angry. For half a century they had been campaigning for the vote but Prime Minister Herbert Asquith was still refusing them that right and the authorities had started force-feeding women on hunger strike. Marching and handing out leaflets did not seem to be enough and so some suffragettes began throwing stones and chaining themselves to the railings of prominent buildings. Then, on the evening of Sunday, 2nd April 1911, the Women’s Freedom League and Emmeline Pankhurst’s Women’s Social and Political Union [WSPU] decided to boycott the census. If women did not count, then they would refuse to be counted! Suffrage Historian – Jill Liddington – has written a book called Vanishing for the Vote: Suffrage, Citizenship and The Battle for the Census. She joins Jenni to talk about the women who boycotted the census. VANISHING FOR THE VOTE: Suffrage, Citizenship and The Battle for the Census by Jill Liddington is published by Manchester University Press.